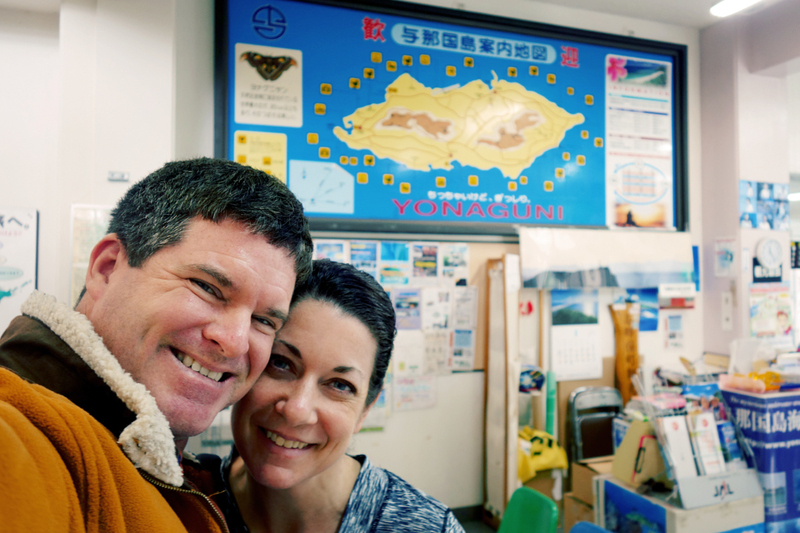 So read the cover of the box of chocolates that Jody hauled all the way down to Yonaguni Island…. 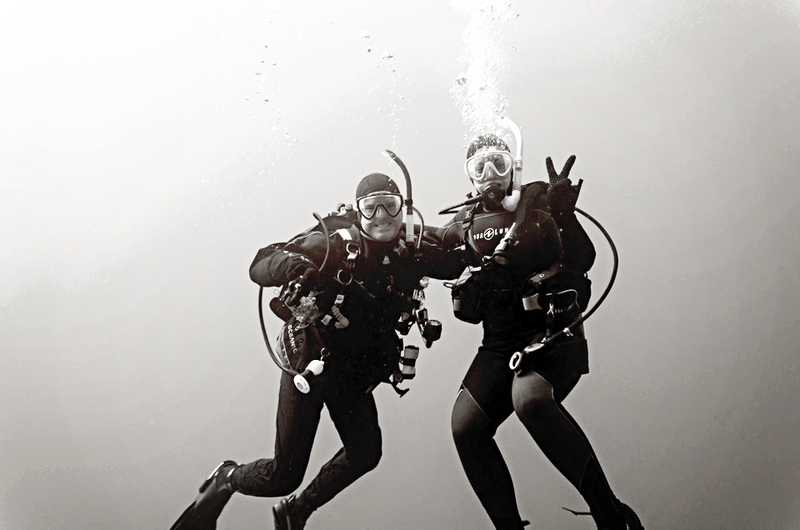 Deciding to spend the long lovers’ weekend to dive specifically with migrating hammerhead sharks in the waters around the extreme southwestern Japanese islands, this was indeed the perfect valentine gift. A picture was immediately posted on Facebook, and “JAW-SOME” became the catch-phrase of the trip to describe our dives with such wondrous apex predators of the mysterious deep. 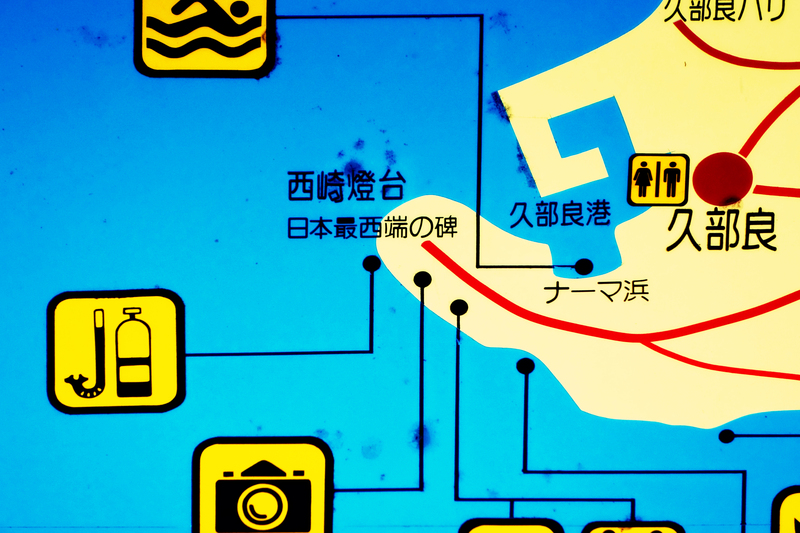 Yonaguni – more Chinese than Japan! 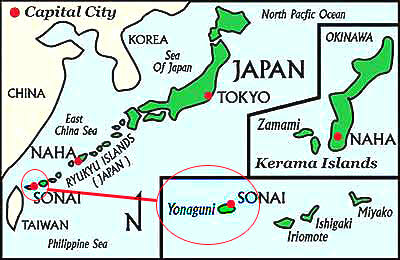 Yonaguni (与那国島, sometimes Yunaguni) is one of the Yaeyama Islands, famous for being the westernmost inhabited island of Japan. Located only a mere 67 miles from Taiwan, that island-nation and general thorn in China’s side is visible from this part of Japan on a Chinese-pollution-free day (see Smoke Gets in Your Eyes for more on Japan’s smoggy skies). 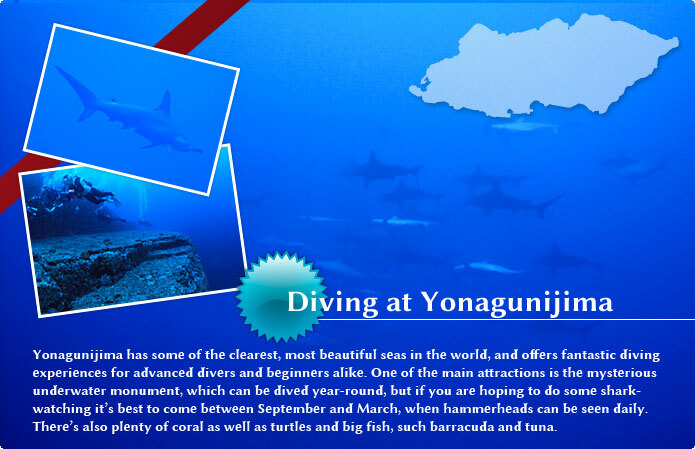 Yonaguni is exceedingly popular with divers exactly because of the large numbers of hammerhead sharks that school there during winter. February and March are said to offer the best times to swim with the sharks, often times schooling in numbers verging on the uncountable. Not only are the sharks present daily during this period, most of the shark dive sites are located just minutes from port, situated over steep cliff-like underwater drop-offs, allowing for great visibility, big pelagics, and strong currents in which to cruise. This is what we all dreamed of! Dives one and two (of eight total) during our 4 night stay were on the Yonaguni Monument – more on that is an upcoming blog. 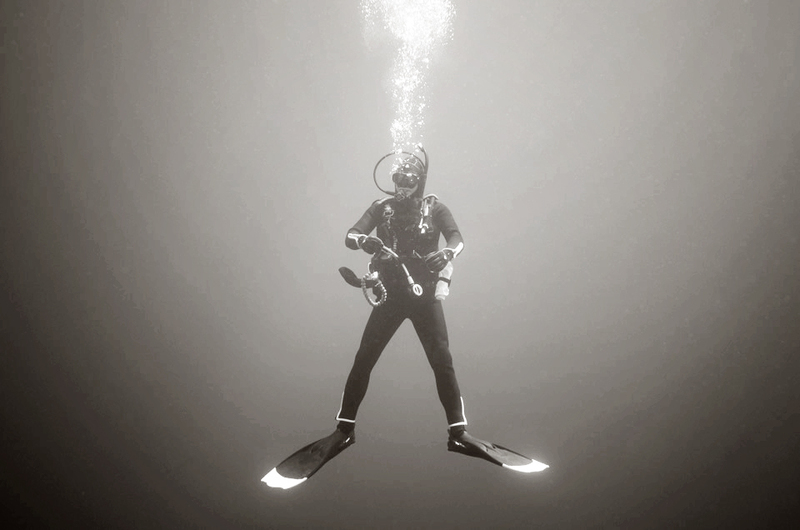 The next six dives over three consecutive days were all about stopping…because…(wait for it)…it was Hammer Time! Or they involved shark hunting. The kind where the only shots taken are with cameras and the only stuffing was of our large western bodies into Asian-sized souvenir t-shirts! The weather was beautiful for diving, almost couldn’t have been better. A rainless weekend with temperatures actually reaching up into the 70s, we were all surprised that even the seas around Yonaguni were about five degrees warmer than the cold winter waters of Okinawa this time of year. 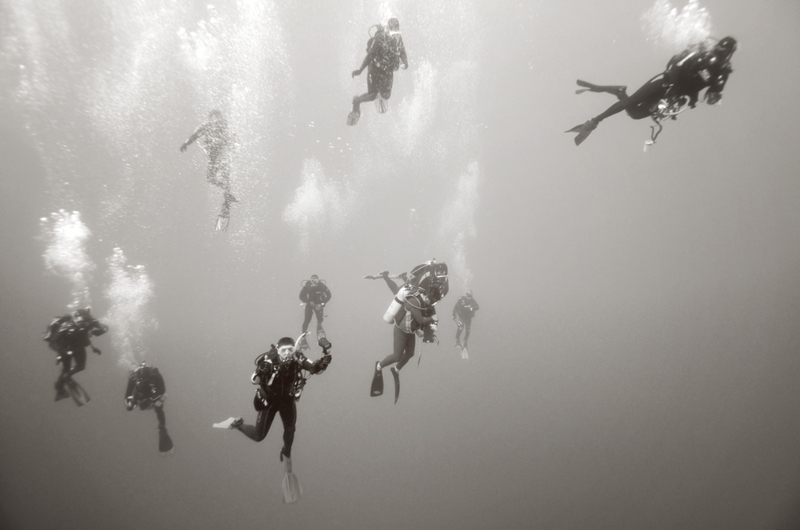 Although the winds shifted and started to blow and its fetch raised a healthy sea, it was only bad enough to cause one case of sea-sickness in our group of eleven divers. 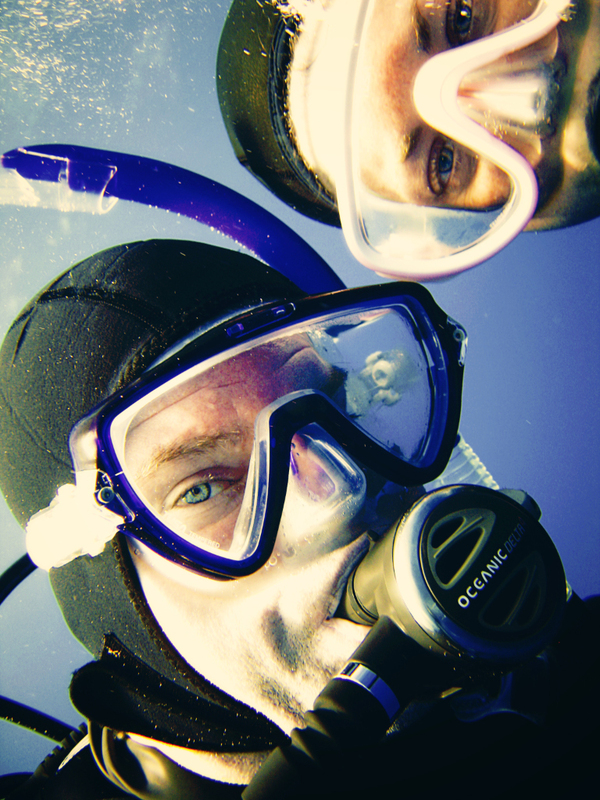 A Money-Shot from our Dives! The hammerheads of Japan’s southern seas are of the “scalloped” variety Sphyrna lewini, part of the family Sphyrnidae. Not surprisingly, the Greek sphyrna translates as “hammer”. The most obvious feature of this shark, as in all the other kinds of hammerheads, is the “hammer” shape of their head. Although smaller than the Great and Smooth hammerhead species, scalloped hammers are fairly large at around 14 feet and well over 300 pounds, and is the most common of all hammerheads, consisting of nine species total. Hammer Hunts dives 1 and 2 were almost identical disappointing repeats of each other. Taking a left out the port and heading southeast, we dropped in just about ½ mile offshore in water so deep that the bottom often couldn’t be seen even at 80’ but which ripped by at what we estimate as 8-10 knots. 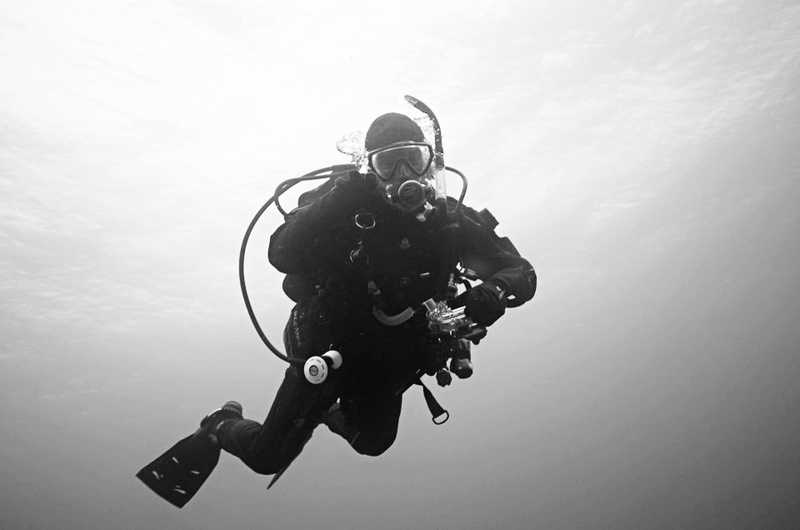 We all would corral into a loose group at 30’ with the Divemaster, then head down to 60’ to drift and wait. And wait and wait we did, for the next 30 minutes each time. 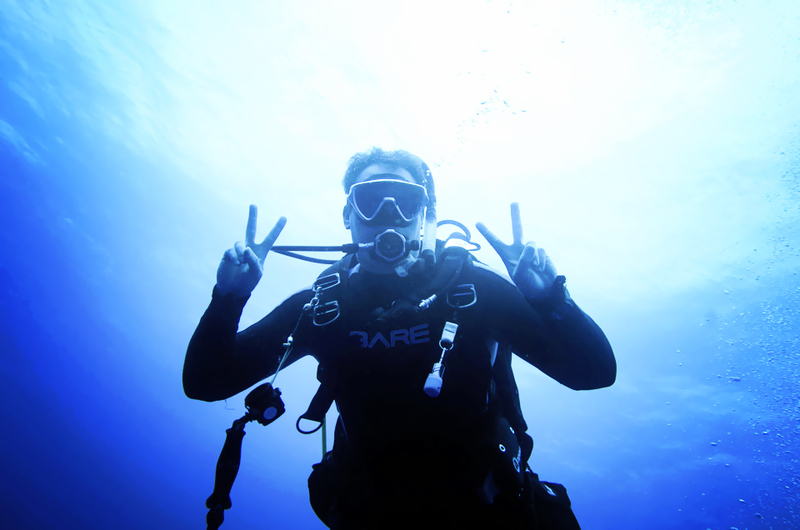 At that point “time” was called by our Japanese divemaster, making a “T” with his hands. 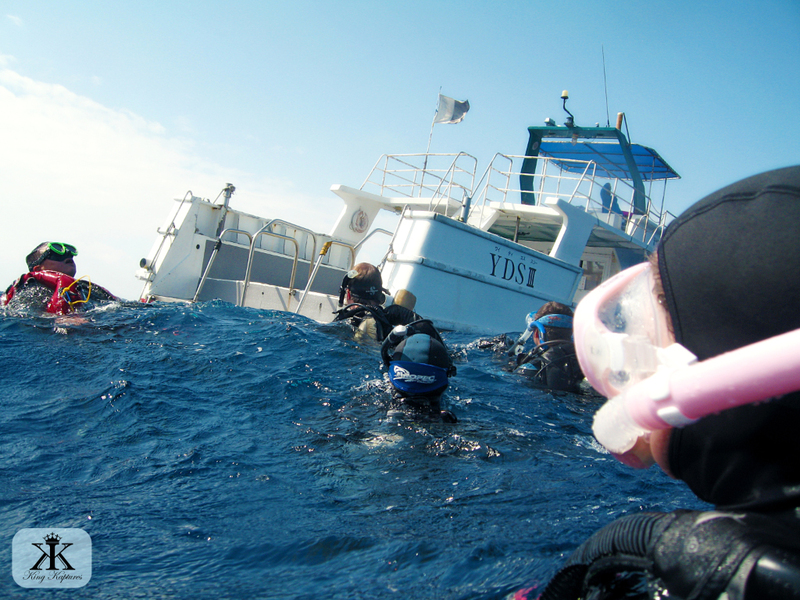 We slowly ascended up to our safety stops, and then surfaced together to await pickup by the dive boat, quickly backing down on our group bobbing in the 2-4 foot seas. “Okay! Go to the boat. Go! GO! 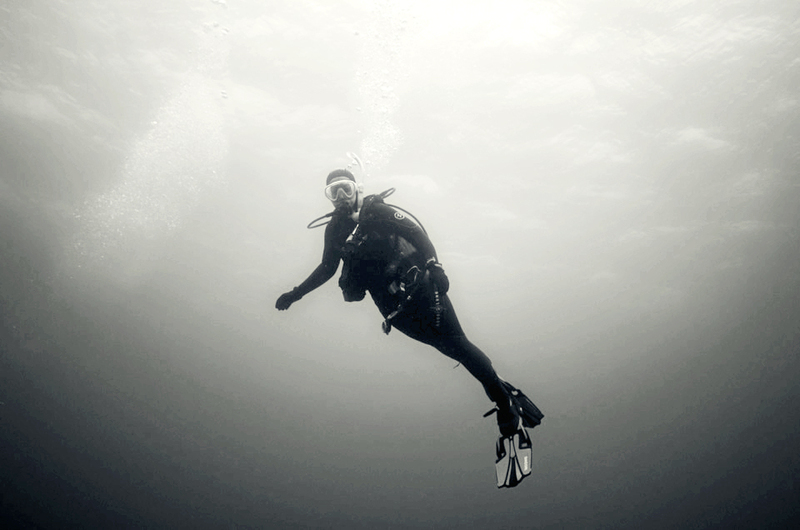 GOOOOO!” the divemaster pleaded with us as both we the divers and the boat captain fought the ripping current. Once aboard we all agreed: yes, there were shadowy sightings here and there by some members of the group, but no real confirmed sightings of anything concrete and in the numbers all of us expected. The scalloped hammerhead primarily lives in warm temperate and tropical coastal waters, down to a depths exceeding 1,500 feet. These sharks have a very high metabolic rate, which governs much of their behavior. 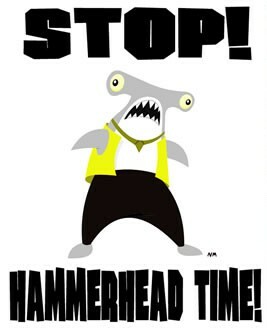 Hammerheads feed on cephalopods, such as squid and octopus, and fish such as sardines, mackerel and herring. Larger sharks also feed on smaller sharks, such as smaller reef sharks. During the day they are more often found close to shore, but at night they become solitary hunters moving further offshore and into deeper waters. For shark hunts 3 and 4 we all were getting more eager (and maybe less patient) to see sharks. Some of our group met some Japanese ladies who, the previous day, had dropped into a huge group of schooling hammerheads! And this very morning another group with our dive charter spotted 5 swimming together. Our chances had improved. Or so we thought. While these sharks can pose a danger to humans (Scallops are one of three hammers that have bitten humans), they are not normally considered aggressive. But that’s not what we’ll tell all our friends! 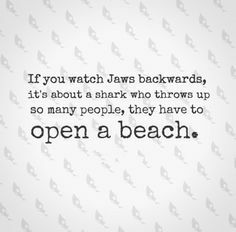 Nor is that what most people will think regardless of any bizarre statistic illuminating the chances of a shark attack that you may choose to quote. 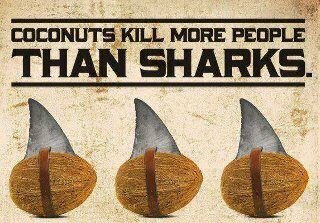 Like my personal favorite: a person stands more of a chance of dying from falling coconuts than he or she does of a shark bite…. 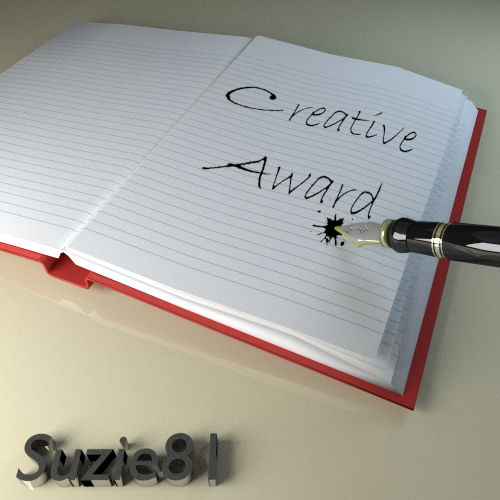 It’s true; check it out! Hammerheads, if confronted or provoked, respond by dropping their pectoral fins and swimming with stiff, jerking motions – a clear warning that a diver should retreat or seek shelter. “OHHHH-kay, ev-re one! Red-EEE?” our Japanese guide inquired while standing on the top of the boarding ladder at the stern of the boat. “OHHHH-kay, let’s GO!” he finally responds to our impatient replies, then counted quickly in Japanese, “Ichi-nei-san!” And with his “one-two-three” he disappeared into the foamy white waters churned by the boat’s screw and stern dive ladders. 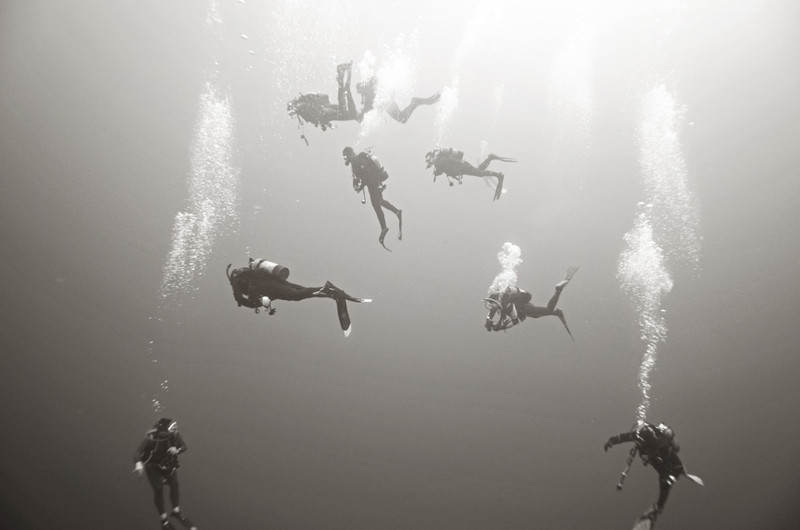 We all followed in quick succession, dive-bombing the ocean much like skydivers exiting an aircraft as quickly as they could. And believe me, we certainly were no more graceful! This Shadow Came Back Around for Another Pass!! 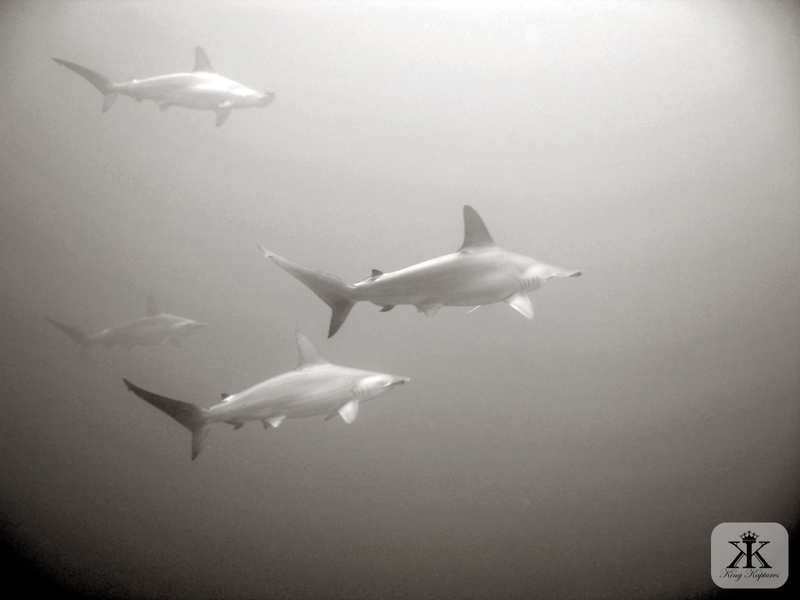 With whitish bellies and greenish-grey dorsal coloring, hammerheads quickly blend into the reduced visibility ever-present in the murky ocean depths. I’m convinced this type of melding with the environment is exactly why combat aircraft are painted the same greenish-grey coloring: to blend in with the haze always at the horizon. These sharks have an uncanny ability to simply disappear with a sweep or two of their tails. No wonder we saw so many creepily teasing shadows! Hammerheads have better vision than most and can actually see 360 degrees; by looking up or down, they can monitor the complete seaspace all around them. Like all sharks, hammerheads have electroreceptory sensory pores and nostrils on their snouts. 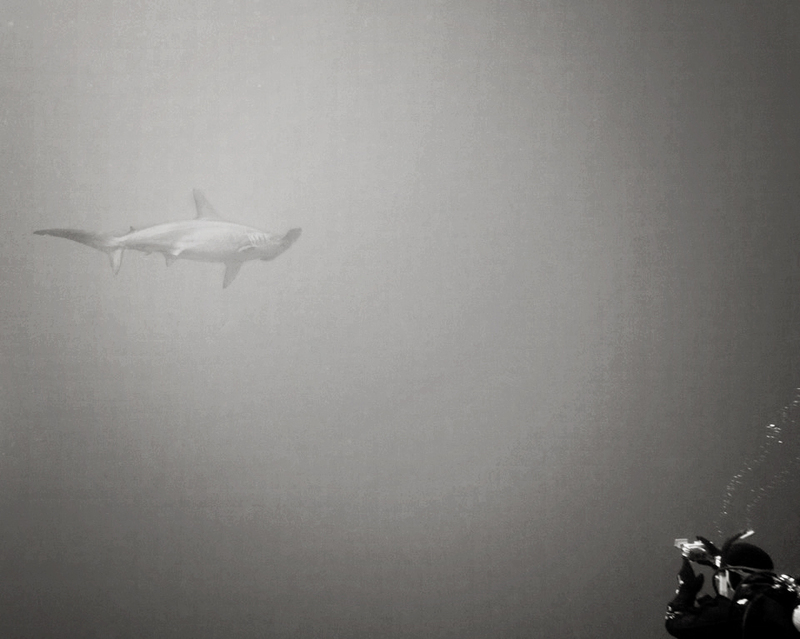 But in hammerheads these sensors are spread out over a much wider area, allowing these sharks to hunt more effectively. This special arrangement of sensors allows for the detection of as little as a billionth of a volt, and when combined with excellent smell, the sharks can quickly classify and hone in on distressed, diseased, or decaying organics and other bodily fluids. And yes, to answer your question, those fluids primarily include blood. Drifting quickly with the fast-moving currents, we drop again deep to about 70’. And then THERE. There was one. In the murky distance. And as quickly as all of us could grab a tenuous handhold on a massive nearby stone block, the shark was gone. There wasn’t ever enough contrast for any of our cameras to focus. 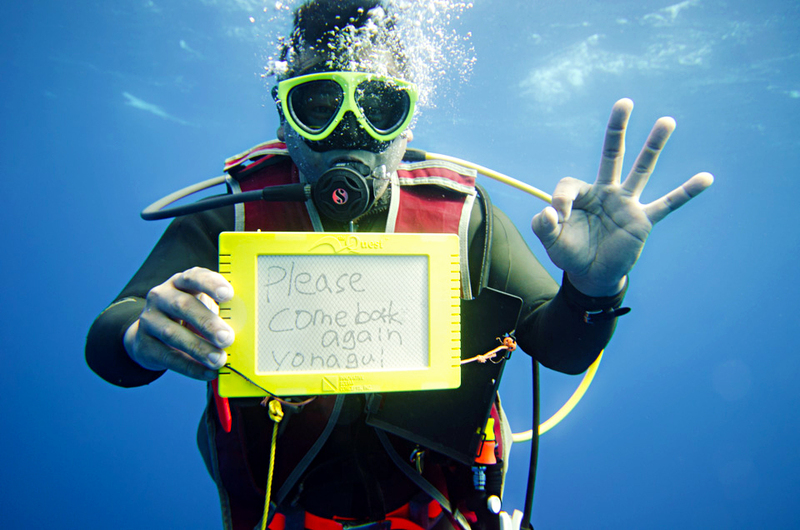 And you know what divers say about underwater claims: didn’t happen it there isn’t photographic proof! We released our grips and were immediately flying again with the swift currents, and surfaced once again with only a couple of sporadic sightings and lots of talk about shadows darting here and there. But these nebulous sightings weren’t what any of us had come so far for. Personally, I’ve had the pleasure of diving with many sharks along the southeastern coast of the United States, where sharks (grey reefs, nurse, and bulls mostly) are seen routinely. I’ve also had the opportunity to partake in no less than three “shark feeds,” a rare chance to see a shark feeding-frenzy, live, up close and personal. No, we all were in Yonaguni to see schools of hammerheads, not just their fuzzy ghosted shadows at the edge of our perception. Unfortunately, hammerhead sharks are massively overfished, slaughtered simply for just their fins. These sharks are captured, “finned” where their dorsal, pectoral and tail fins are all sliced off, and then the shark’s body – still alive – is thrown back into the sea to die a slow, painful death. Because of this savagely wasteful practice, the scalloped hammerhead is on the “globally endangered” species list, with population declines of up to 95% over the past 30 years. Hammerheads are among the most commonly caught sharks for finning. But they are also used in food products (“flake,” fish fingers, fish & chips), and commonly killed as by-catch due to indiscriminate fishing practices. Our last day on the island had arrived, and we only had two dives left. This was it. The weather was moving in, winds were up and the seas had started to kick. Some boats were not going out to the area where the sharks congregate, but our diving service was still gaming for the hunt. We were pleading to be taken to another dive site, as the last four dives at the same location yielded just about squat. 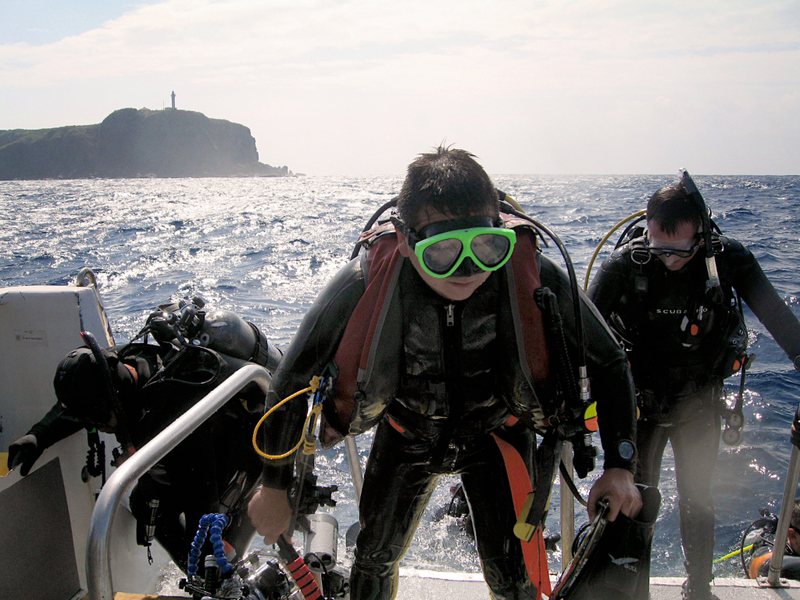 The staff at YDS – Yonaguni Diving Service – agreed and our boat’s captain decided on a different locale. Making the quick trip from port, we got ready once again. The boat was a-rockin’ as we scrambled off the stern, but on dive five, again only a single hammer was sighted, one much deeper and more shy who fled no doubt upon sensing not our presence but our desperation! Killing millions of sharks every year just for their fins is an immoral waste and non-sustainable practice. Shark fin soup is merely a status symbol in Asia, one reserved for only royalty. The fins don’t even add flavor, but instead are dried and used as only a texture. While shark fin soup is an expensive delicacy at up to $100 a serving, more and more people, groups, and even restaurants are giving up the dish and calling for a ban on the practice of finning. 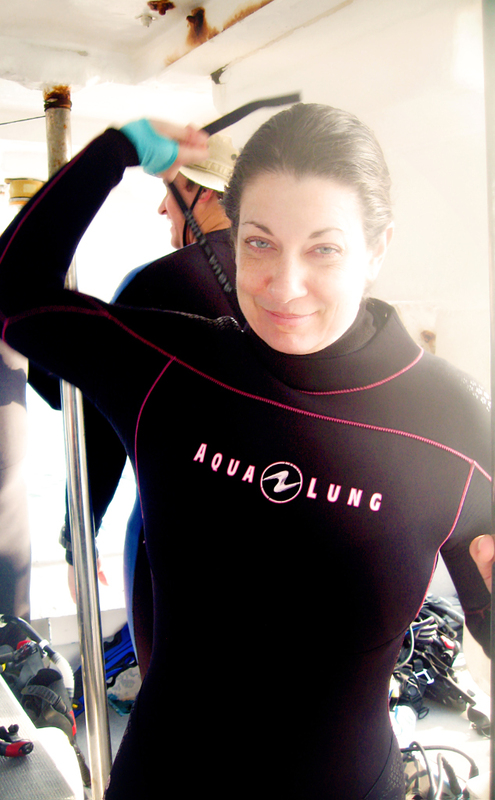 Jody is Ready for Some Shark Schooling! Divers Happy about the Sharks! And then the last dive was upon us. This was it. A $1,400 per person five-day trip with three days of rather exhaustive diving had all come down to this one final sub-30 minute dive. The pressure was on for YDS; their and our divemaster’s reputation for amazing shark dives was on the line. We returned to this new location in even rougher seas and dropped in once again. And very soon after reaching our drift depth…. One. Then two more. No wait, there are FIVE! Yes, we had found them – there they were, schooling together!! 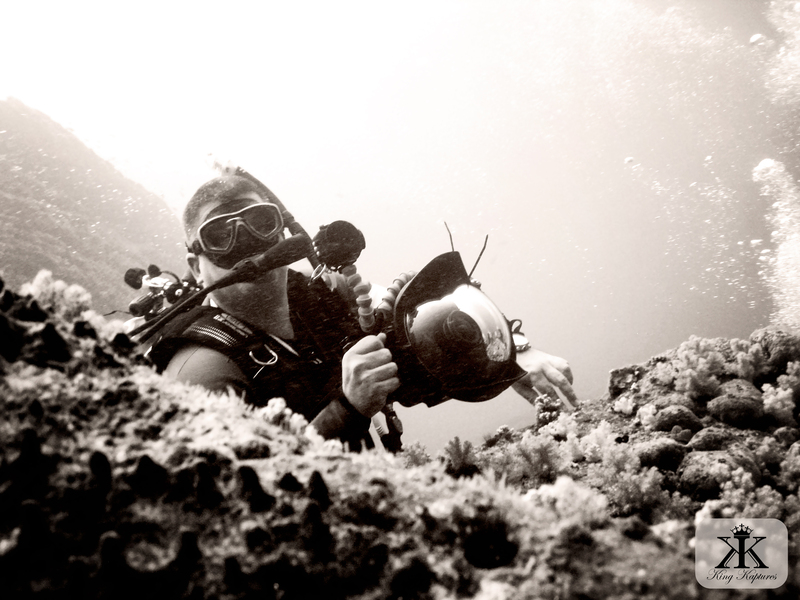 Our divemaster tapped on his tank with his simple noise maker – a long steel bolt tied to his buoyancy compensator. 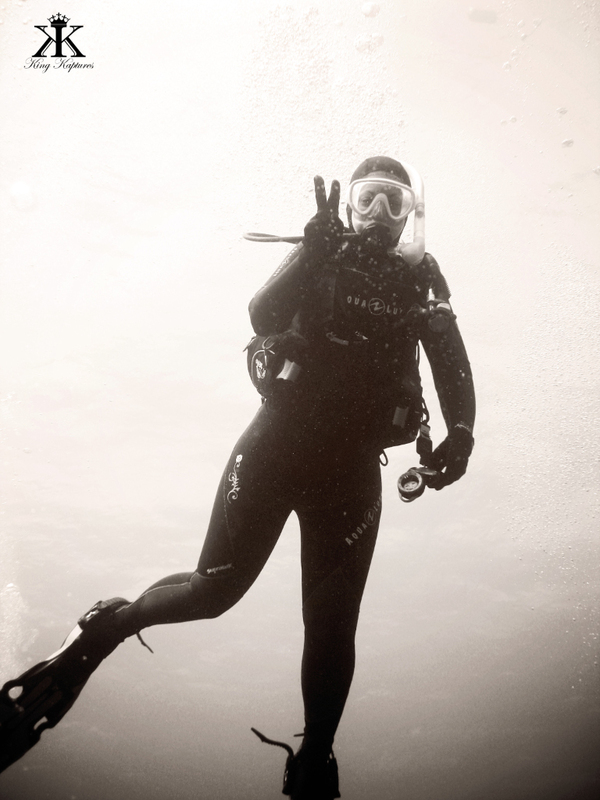 I only glanced his way having already spotted the sharks, enough to see him make the hammerhead sign he had briefed. 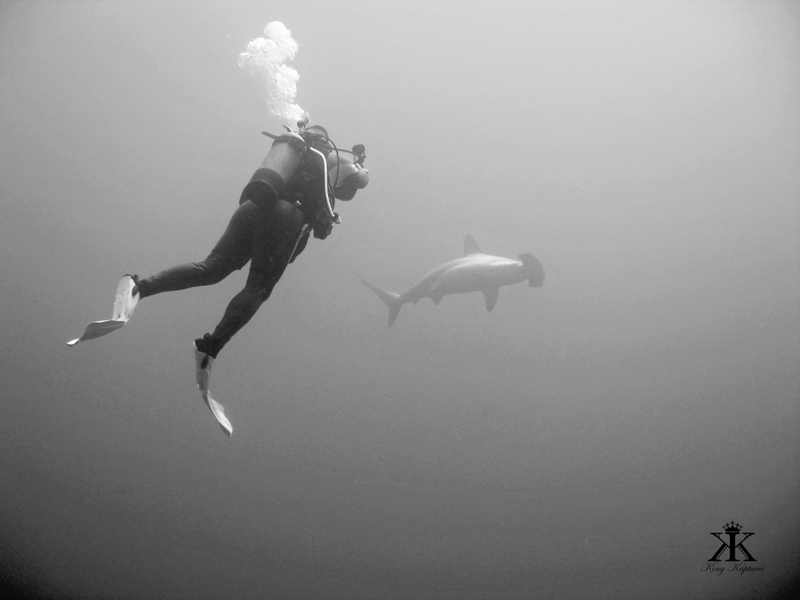 I was lucky enough to be on the side of the group where the sharks were schooling, and immediately but slowly starting making way in their direction as I descended deeper and deeper to match their depths. Snapping photos and admiring their sleek and powerful beauty, I checked my computer as I was passing 110’, plenty deep enough with our time and air constraints. 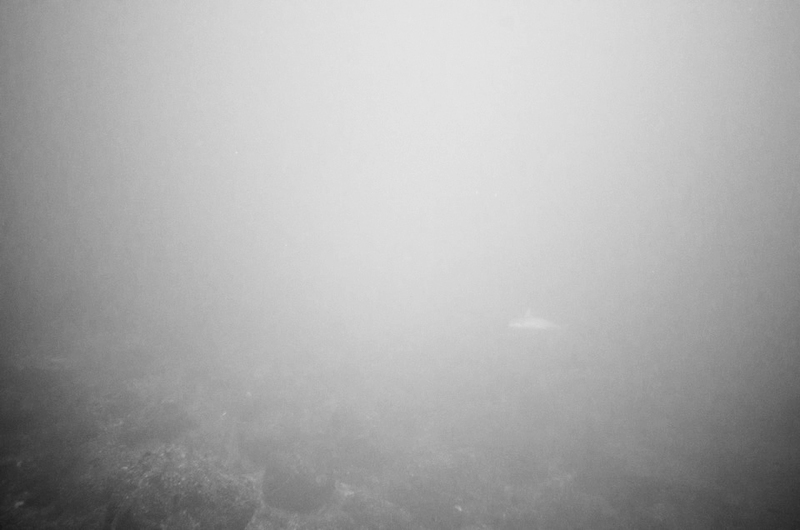 We were warned the sharks would drag us deeper and deeper, and as these sharks continued downward there was still no bottom in sight as I leveled out at 116’. A Small School, but Still a School! This school of scalloped hammerheads, although small by Yonaguni standards, was an amazingly invigorating sight. While an accurate count is hard to come by, we agreed that there were at least ten in our immediate vicinity. A few even hung around to make another pass, seemingly as interested in us as we were in them, an event I decided to video with my ten-year, non-HD small point-and-shoot underwater (see my underwater photos of Japan at Dive The Blues Scuba). 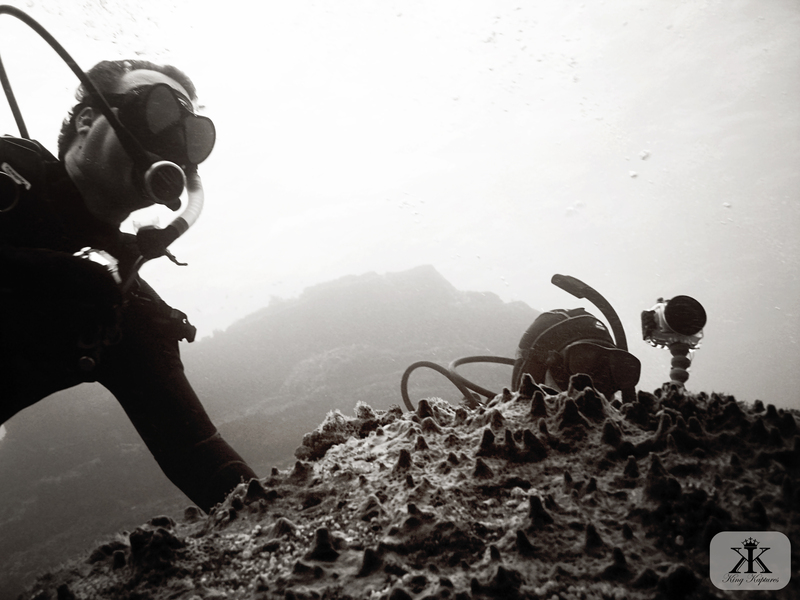 To divers, this experience is akin to those seeing a lion up-close-and-personal on safari in the Serengeti plains of Africa. It is hard to describe the surge of emotions one feels when faced with an uncaged, untamed wild apex predator on their own turf (as it were) and terms. And in numbers that could not be defended against. It may be difficult for some people to grasp, but stepping foot in the ocean at the beach in just a bathing suit is really no different from walking into the jungles of Southeast Asia wearing just the same. And who would do that, right? The sea is not our domain nor do we belong there, and when we tread into the jungles, terrestrial or aquatic, we must be ever wary and always respectful. 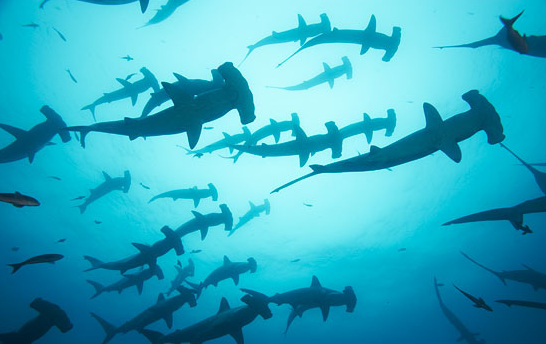 We rely on the earths’ oceans, every bit as much as the hammerheads do. The earth’s weather, our fresh water, much of the world’s food supply, and even the very air we breathe are all sourced from the seas. Sharks play a critically irreplaceable role in the ocean’s massive aquatic ecosystems, and have every bit a right to be here as you and I. They deserve our respect as much as they get our admiration. 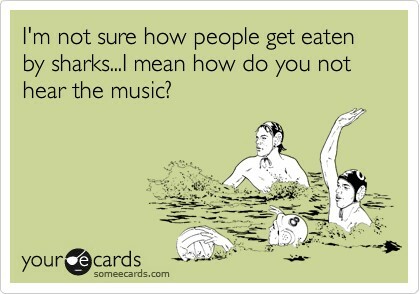 Shark fin soup? No thanks. 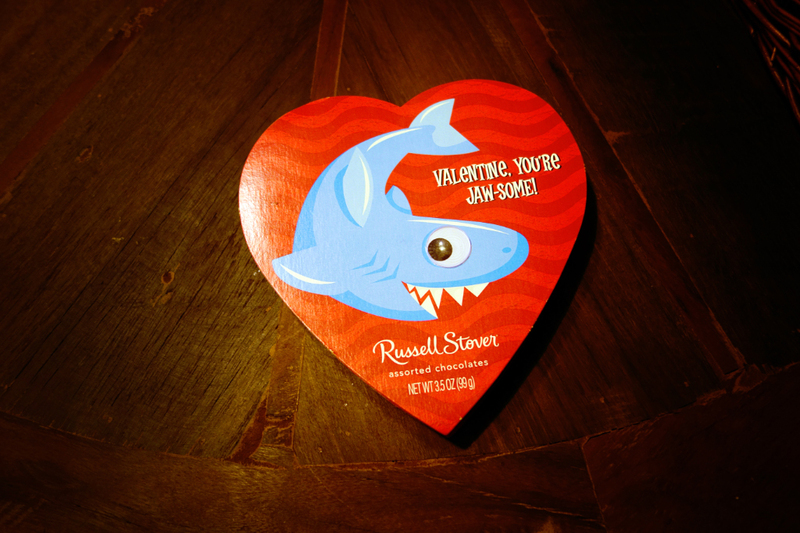 I’ll take an inexpensive box of “JAW-SOME” chocolates any day…. 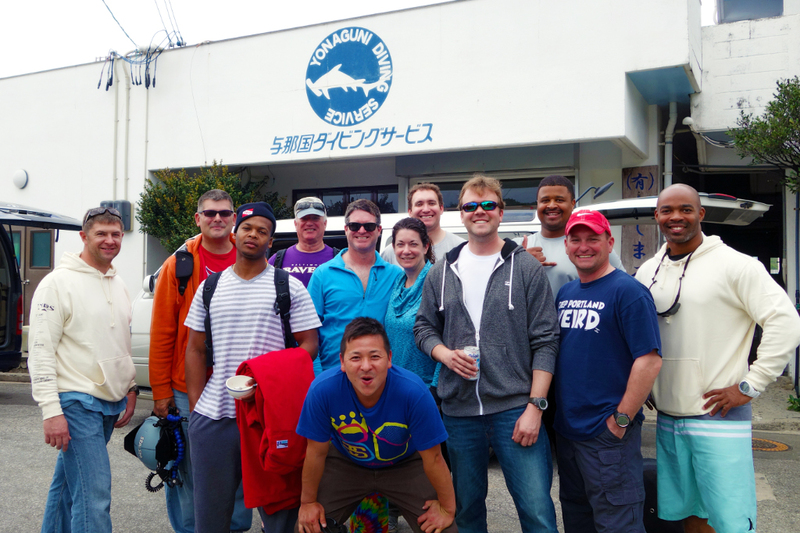 Our Dive Group with our Japanese Guide!